Welcome to our families farm dinner. We hope you will join us for this great event. We started a Prevedelli Farms Scholarship for high school students going to college who are majoring in agriculture. To raise money for the scholarship, we host an amazing farm dinner right in our beautiful apple orchards. intimate experience that showcases our quality organic farm produce. The dinner itself is composed of five courses. For our first course, we serve appetizers and champagne in our 100-year old farm barn. to see our families orchards and learn the workings of the farm. middle of our apple orchard over looking the Monterey Bay. of Felton California, located in the Santa Cruz Mountains. 5:00 pm Tour of the Farm - Silvai and Sam will show you our beautiful farm and explain what and how we grow our product. Come learn the history of our farm and family. 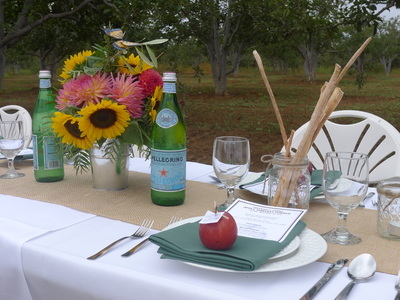 5:30 pm Dinner is Served - Sit family style in our apple orchard and enjoy a fabulous dinner and wines. All ages are welcome, although the dinners are more appropriate for adults. Tickets are $150 per person, non-refundable. farm to table organic fare. He supports local businesses by utilizing local farms and fisherman. great passion for him. 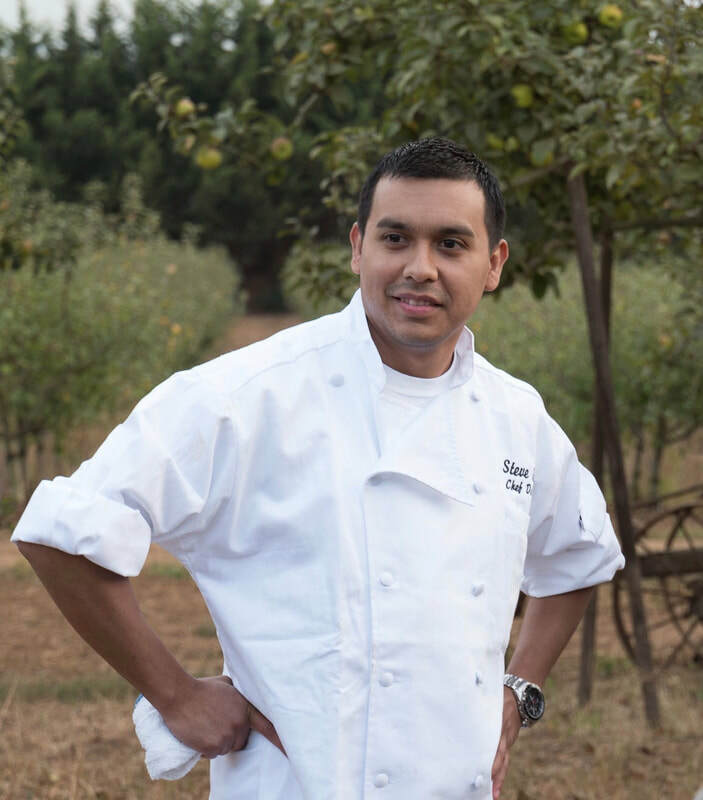 He graduated in 2008 from the Institute of Technology’s Culinary Program in Clovis, CA. Where, he’d fallen in love with all aspects of the industry. First working for the University of Fresno and the Fresno Convention Center, He then moved to Las Vegas to work for the French Bistro Marche Bacchus. After several other positions in Las Vegas, Chef Steven moved to Santa Cruz, to open up The Hotel Paradox, where he held the position of Sous Chef. Shortly after Patlan made the move to Pebble Beach at the Inn at Spanish Bay. Following this position he became the Sous Chef at Quail Lodge and Golf Course Resort in Carmel. ​ Chef Patlan then spent a few years working for the Sardine Factory Restaurant . This will be Chef Steven Patlan 2nd year helping us with our farm dinner. Our last dinner with him was a huge success. Everyone raved about his food. ​It's going to be exciting to see what he creates for this farm dinner. Pastry Chef Karin Johnson is a graduate of the Culinary Institute of America and has been baking over 20 years. Chef Karin also graduated from Santa Barbara City College culinary program. Chef Karin has sold pastries at farmers markets and supports and buys straight from the farmers at the markets! have been involved since the beginning. Now my sister her husband and my nephew and niece are involved! 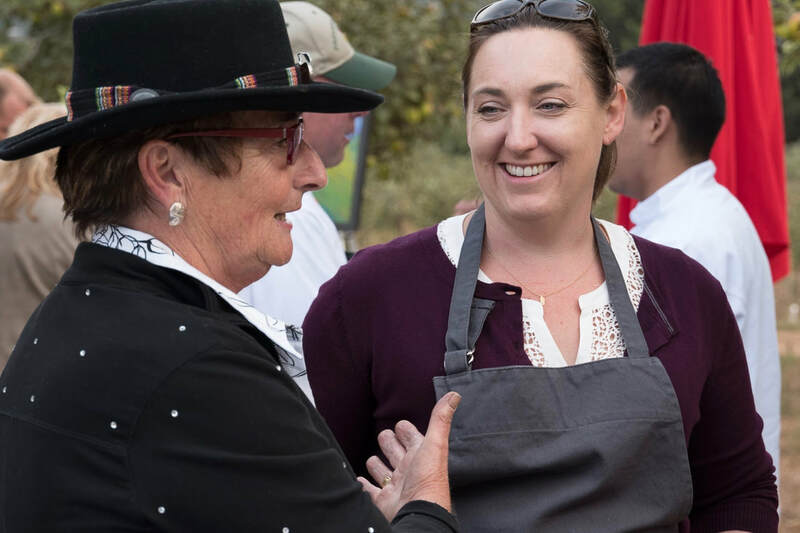 This will be Chef Karin's 4th year helping with our farm dinner and other events at our farm. our appetizer course and most importantly, the dessert course. Dinner will be paired amazing wines from the Santa Cruz Mountains. climate are ideal for producing premium California varietal wines. All of the Surf City Cider products are crafted at the historic Hallcrest Vineyards Winery in the Santa Cruz Mountains. Continuous wine production has occurred on this property since 1945. Our ciders have the unique privilege to come of age side by side with award winning Pinot Noir and Organic Wines. With over 35 years of innovative winemaking experience and the prestige of being the first organically certified winery in the country allows, our ciders are produced under these philosophies. We choose to source only organically grown apples from the Santa Cruz Mountains and the Pacific Northwest. Much like vintages in wine, we acknowledge that each blend of apples will be slightly different depending on the year, even the time of year. Much like the delicacies in white winemaking, we approach our cider fermentations with the emphasis on utilizing white wine yeast who contribute complexing aromas and fermentation health.